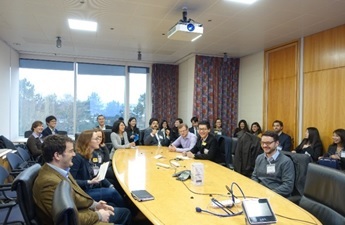 On 29 January 2016, 30 MBA students participated in the Sony Europe company trek—an activity organized by the Cambridge Asia Business Association (CABA). This was a great opportunity for us to go out of the classroom and see the theories we’ve learned in class applied in real life. Sony Europe (based in Weybridge, UK) is the head-quarters of all Sony’s business units in Europe and it has been growing strongly. As part of the CABA, our aim of the trek was to understand the Japanese leadership style and how Sony, as a Japanese corporation and one of the largest and successful companies in the world, is facing issues of globalisation and localisation in Europe. To gain insight, we invited a wide range of speakers from Sony Europe including the Head of Operations, Head of Digital Communication, General Manager of Sales and Marketing, Head of Human Resource, and the CFO of Sony Europe. We also had lunch with Tom Kemp, their Human Resource Manager who helped us organise the trek, and we also took a tour around the office to get a feel for Sony’s corporate culture. Through presentations from various speakers, we learnt about Sony’s corporate culture, which is customer-centric and focused on Gemba, a Japanese word meaning “on the field” or “the real place.” Gemba philosophy encourages employees to go and out and speak to customers to understand what is happening on the ground. This idea is the underlying culture for all the employees in the company. Many of the speakers specifically mentioned the word Gemba throughout their talk and we were surprised at how widespread the notion of Gemba is at Sony Europe. We also learnt how the Japanese concept of Kaizen (continuous improvement) is deeply rooted in Sony’s corporate culture. Employees spoke about marginal gain—that is if every store could increase their performance by 1%, the company as a whole would be better off; and how sales teams work closely with stores and constantly monitor store performance to identify any opportunity for marginal improvement. Through this trek, we learnt about the key success factors of Sony in Europe: Gemba philosophy, marginal gain or continuous improvement in every aspect of their business. These ideas are the key to successfully balance between globalisation and localisation strategies as a company can no longer compete solely on globalisation. Sony’s famous slogan “think global and act local” emphasises the need to adopt a global strategy but grant autonomy to local subsidiaries. 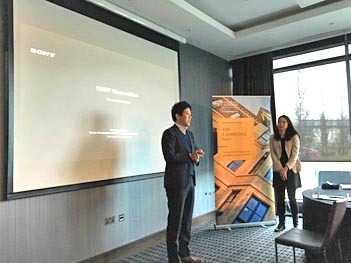 Sony Europe Trek is one of the first initiatives of CABA and we hope to hold other events to learn more from leading Asian companies and business leaders.